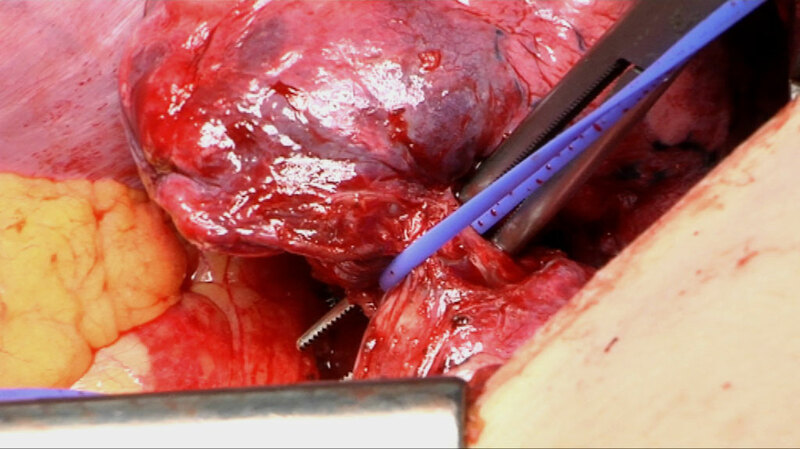 This is the first in a series of posts where I’ll go through different ways of shooting surgical video. First out are cameras integrated inside the handle of surgical lights. 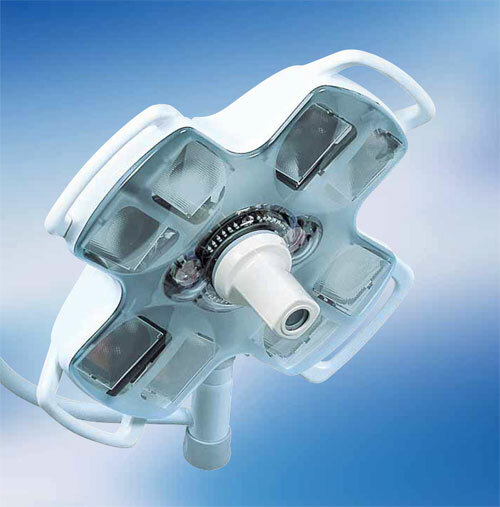 The handle-integrated camera is one of the most common solutions used to record video of surgical procedures. Most surgical light manufacturers produce lights with optional cameras. These cameras are not only used for recording video, but is also a way for nurses and students to get a good view of the operation. Most surgical lights are constructed as parabolic reflectors that concentrates the light into a narrow beam in the center axis of the light. In most cases the center of the lamp will point directly to the center of the operating field. In theory a handle-integrated camera will therefore cover the operation very good. This is however not always the case. The light handle is kept sterile during surgery, so the gloved surgeon can reposition it without becoming contaminated. Consequently the handle-integrated camera can not be positioned by a skilled videographer (unless he is also wearing sterile gloves). The surgeon, of course, have to focus on the surgery, so all considerations concerning the video always comes second. Good working light is important, and in many cases the best positioning of the light will result in bad framing. In some cases the repositioning of the light can produce viewer confusion as to the orientation of the patient and the anatomical structures. This is a video still from a lung cancer operation (lobectomy) where the light was positioned in a way that provided good light but bad framing. Approximately 50 % of the footage from this operation was framed similar to this. One of the biggest problems when filming surgery is the surgeons’ heads. They get in the way all the time. This is especially the case when using handle-integrated cameras. The light handle is fixed in it’s position to the light. I have yet to see a camera like this that can be panned or tilted. Most of these cameras can not even zoom, but have a fixed focal length (most often quite wide angled as in the video still above). So it’s not possible to adjust the framing without moving the light. Not a very good starting point for quality video production. The surgical light cam still is blury, has dull colors, and most important, it’s too badly framed and too far away from the wound to show anything of interest. Broadcast quality 3 CCD-cameras are getting smaller by the day, but when it comes to video integration, surgical light manufacturers are not exactly cutting edge. Based on my own experiences with handle-integrated cameras, they’re good for showing the operating field on monitors inside the OR (CCTV), but they’re close to useless when it comes to producing quality video of surgical procedures. Waw! You definitely have very interesting profession. Can you tell me more about how you started doing this job. Did you go to school for that? The story behind that is worth a post of its own, so stay tuned! I studied to become a video engineer, and after working some years in broadcasting, I sort of stumbled upon this profession. Could you tell me where to find the light handle for the light with the hole for the camera? We have a rolling ALM light build in camera but we are having hard time finding the disposable handle. I’m not really sure. I would think it was supplied by the light manufacturer. Great article! I myself photograph and film plastic surgery procedures and completely agree with you. It can make you sick watching a light mounted camera as it spins and twirls. While nothing works as good as a human tripod I have found a couple items that work pretty good. Depending on the layout of the OR you can mount to floor or ceiling. I position the camera at the foot of operating table, dead center, approx 10ft up. I will use a flex mount or 2 so I can position the cam just where I want it. I have found that position to be the best if you don’t want the surgeon to hide what he is doing with his head. For bigger ORs I will use a wall mount extendable boom with a couple flex mounts on the end. Below are links to similar contraptions. I haven’t tried any of the solutions you describe. Is the wall mount something you attach to the wall permanently? PLEASE get in touch with me ASAP? Have well-known director/producer who is interested in the project you started. Seriously. This article is extremely helpful to me as I am currently designing a new surgical skills laboratory at Columbia and want to have video at each station. I realize this article is from 2007, so what do you think the best approach is at this time. Should I forget about in-light cameras completely and go with a separate camera. If so, what camera would you recommend? Yes, the article is a bit old and I should take the time to do an updated version. If you’re designing a new lab and want to integrate video into the system I would probably go for a camera on a separate arm. Several of the surgical light manufacturers offer this now (e.g. this system). This will provide much better framing than an in-camera light, were there always has to be a compromise between best light and best video. It is probably convenient to have the camera as a part of the roof setup, rather than a separate system. Hope this was a useful answer. Good luck with the lab! Hello, I am seeking a “camera clip” to the headlight for my surgeon. He trialed the POREX version & complained of neck pain. With all this spy technology I thought there could be something out there “tiny” to place on the head crown but could be HD. Thoughts? i am a cardiac surgeon looking to get some of my surgical work captured in good videos and looking at buying some cameras. with this insight have dropped the idea of the luxtec and surgitel cams and looked at the HD Hero with the different mounts. please give some advise for me to go forward on this. You are currently reading Surgical light cameras at The Sterile Eye.